Earlier this week, I was lucky enough to spend three days with talented puppeteer and maker, Chris Wylie in Liverpool. A graduate of the London School of Puppetry, right hand man for "Treasure Trove Puppets" and founder of "Puppetuity", Chris has a wide range of skills and is particularly well versed in the art of modelling, mould-making and casting. Prior to this masterclass, for which I was essentially the guinea pig, I had no understanding of how to utilize these skills in my puppetry. I had never worked with many of the materials and processes before, making this an incredibly valuable course. Chris is, for want of a better word, a huge nerd where this stuff is concerned and with a background in science, he really understands the ins and outs of all these materials and processes. I on the other hand, do not have a scientific mind in the least, but Chris managed to find the perfect blend of watered down explanations and practical examples to help me really understand what I was dealing with. A very patient and encouraging teacher, Chris was always happy to explain things to me several times where I needed it. Working in a one-on-one format was a real treat, and as Chris knows me quite well already, the course was very well structured to suit me personally. What did I learn? I must say I am very excited by the techniques I now have a grasp of. Chris talked me through the pro's and cons of many different materials ranging from different kinds of clay and plasticine, to silicone, neoprene, resin and even a variety of papier-mache's. I now understand how and when these materials can, should or could be utilized. When working on my own model, the face of a baby orangutan, Chris allowed me to test out many different kinds of modeling materials before making my choice. Settling on Monster Clay, he then guided me through the modeling process, advising different tools and methods, the best of which, in Chris' opinion, is your own hands. Though Chris was always close at hand, ready and willing to answer my questions or offer advise, he did keep his distance as I created my model, allowing me the time to play and discover things for myself. Another great balancing act in his teaching. From here we moved on to mould-making. The general rule when creating a mould is: when casting with a hard material, use a soft mould and vice versa. As I was aiming to create my orangutan face using a papier-mache pulp, Chris decided the best option was a silicone mould. 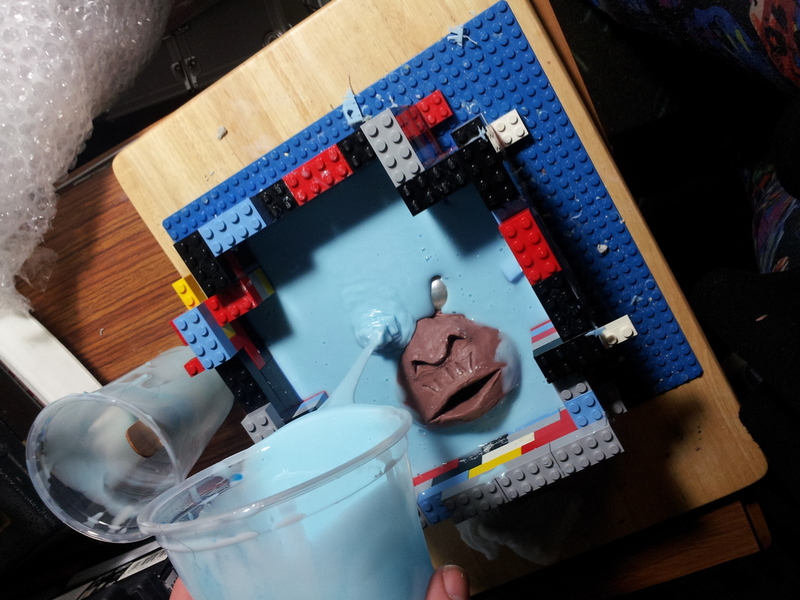 Through this practical exercise, I am now able to understand how to create a silicone mould and will be able to utilize not only the mould created, but the skill set to make many more in the future. Chris also allowed me to try making a plaster mould from one of his own models so that I would understand this process as well. Last on our agenda was casting. For my own mould of the baby orangutan, I had decided on papier mache pulp due to the rough, textured finish it produces, something suited to the rough skin of a primate. The papier mache takes a long time to set however so even now, days later, it is sitting, drying on my table at home as I eagerly await the result. Follow me on twitter to see this puppet's progress; I am hoping to use him for my upcoming rod puppetry module at LSP. Chris wanted to make sure I got a good cross section of skills throughout the course, so also allowed me to cast from one of his own plaster moulds using neoprene which requires a different process again (see photo at the top of this post). There is still plenty of room for trial and error, but my confidence towards experimenting and playing with these materials and techniques has risen dramatically. Very alike the course I undertook with Mark Pitman (see previous blog post), this masterclass opened up my eyes to a world of possibilities. Having a basic understanding of these techniques will allow me to consider these kind of options when creating characters in the future. A fantastic few days, I learned so much from Chris and highly recommend this masterclass to anyone interested in this kind of work. I really can not thank Chris enough.